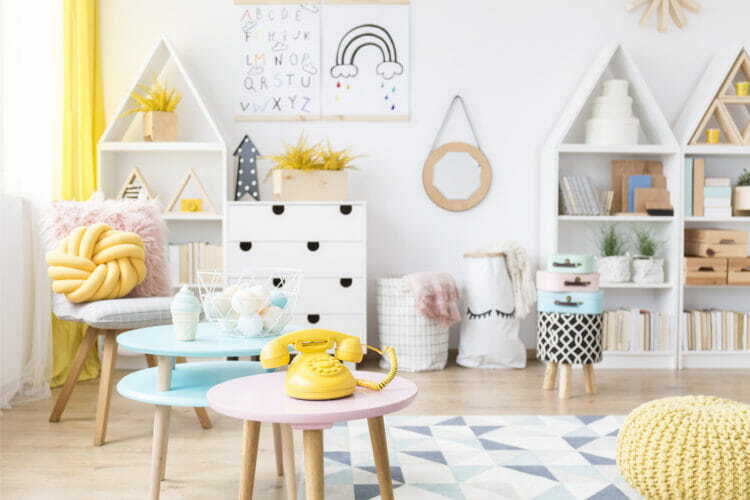 Do you have a chronically cluttered playroom? If you’ve stepped on one too many Lego’s, you may be ready to get a handle on playroom organization once and for all. With this guide, you can learn what it takes to create the ultimate playroom experience for your children, both now and as they reach their teenage years. It’s hard to have an organized playroom without containers to store toys in. Use fabric bins or plastic baskets to sort everything from books to blocks to balls. You can label your storage containers with pictures or words to help your kids put their things away neatly, but it’s not necessary to do so. If you’re worried about having to create fresh labels every time your children graduate to new toys, feel free to skip this step. You can also use numbered or lettered bins to help make cleanup a learning experience. Tell your kids, “Put this toy in bin number 1,” or “Throw this ball into basket D.” It feels like a game to your children, but they’re being productive and learning basic numbers and letters at the same time. Storage solutions with shelves and cubbies are the perfect way to store baskets and bins up off the floor to conserve valuable play space. By using built-ins instead of ordinary furniture, you upgrade the look of your home with a custom design that fits your needs perfectly. You can choose the exact size, style, material and finish to complement the design of your playroom. Built-in entertainment centers are also a great idea to help your kids grow into the room as they get older and become more interested in movies and video games. With options such as custom television integration, specialized cabinets and drawers, bookcases and media storage, and built-in speaker and wiring housing, you can create the ultimate entertainment area for your growing children. From the time they’re toddlers to when they become teens, the playroom will remain your kids’ favorite place in the house. Most parents agree that their children have too many toys, yet kids are always begging for new playthings. Keep the clutter down and save money by storing some toys for months at a time. Then, when your kids start getting bored with their current selection, bring these toys out of storage. They’ll feel brand-new to your children, who should be excited to play with them again. If the toys no longer hold your kids’ interest, you know it’s time to donate them. Do your children ever ask you to join in on an activity in the playroom? They’re comfortable enough sitting on the floor, but you may not be. Rather than taking up precious play space with chairs, buy a couple of inexpensive storage ottomans to sit on. If you have windows, consider installing padded window seats with hinged lids so you can store toys inside. This might even be the place where you hide out-of-rotation toys to keep them close at hand but not out on display. Kids love to draw, color and paint. Consider including an art station in your playroom to facilitate this. Then, simplify your storage needs by choosing a table with a roll-out top. The inside of the table serves as a storage space for coloring books, paint brushes, markers and other art supplies. This clever solution helps you maximize the functionality of your playroom while taking up the least amount of space possible. The traditional place to display finger paintings and watercolor art is on the fridge, but this clutters up the kitchen. Why not add color to the playroom walls by hanging your kids’ creations there? Designate one wall as the art display area. As your children produce new pieces, rotate the oldest ones out. Take photos to document the artwork, and then throw them away to avoid cluttering up your house. Interlocking foam tiles make the ideal play surface for children. They’re soft, durable and easy to clean with disinfectant spray if your child has an “accident.” Consider laying down tiles in one corner of the playroom. This can then become the designated place to play with train sets and building blocks, preventing these toys from getting strewn across the entire room. Are your kids obsessed with mermaids? Perhaps they’re animal lovers, or they have a passion for astronauts. Consider incorporating your children’s favorite things into the design of their playroom. To avoid having to make significant alterations as they grow and their tastes change, you might want to keep the most fundamental parts of the room, such as the built-in furniture, relatively neutral. Then, you can easily rotate wall colors, curtains and accents to match whatever your children get excited about next. Even if you implement all these tips, be aware that the playroom will still get messy. After all, kids can’t very well play without getting their toys out! The difference is now you have reined in the chaos and created designated places to put everything, making it easy instead of overwhelming to pick up the playroom. On that note, decide how you want to handle cleanup time. Some parents instruct their kids to put away whatever they’re playing with before they get out something new. Others have one big cleanup at the end of the day. Try one or both, and stick with the method that works best in your house. From custom shelving units to built-in entertainment centers, the team at Bay Home & Window can convert any wall, corner or alcove of your playroom into a functional, beautiful storage solution. We offer a wide range of high-quality, custom pieces at direct wholesale prices. You can also utilize our professional design and installation services for the best results possible. Contact Bay Home & Window at 888-766-5919 to schedule your free in-home consultation with one of our design experts today.